CIA agent Roger Ferris uncovers a lead on a major terrorist leader suspected to be operating out of Jordan, but while he tries to capitalize on the intelligence he has uncovered he must also be wary of the double-dealings of his boss in America. Taglines: Trust no one. Deceive everyone. Ayesha's cousins are named Yousuf and Rowley. Rowley is an unusual name for a Muslim boy and it stands out. It's possibly a nod to the FBI whistleblower of the same name. Errors in geography: The area around Balad, Iraq is flat, not mountainous. Al-Saleem: As we destroyed the bus in Sheffield last week, we will be ready and prepared for the operation in Britain. We avenge the American wars on the Muslim world. 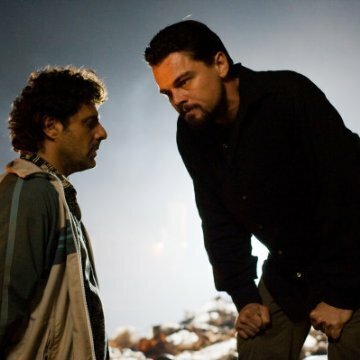 The main thing I was curious about with "Body of Lies" is what sort of film it would end up being. It could have been a post-Bourne action thriller, a serious dramatic thriller with a political edge ("Munich", "Syriana"), one of those intolerably dull post-9/11 films ("Lions for Lambs"), or something like Ridley Scott's brother Tony's "Spy Game", a movie with an interesting premise and disappointing execution. 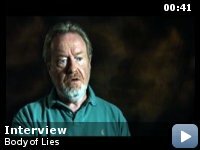 I would argue that "Body of Lies" is the exact opposite on paper of "Spy Game". It's a movie with a questionable, sketchy premise and damn good execution. 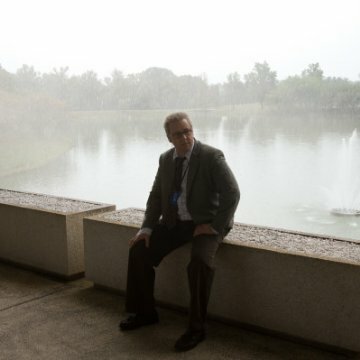 I'd always definitely preferred Ridley's sensibilities and films to Tony's, and his take on a story about a CIA agent working against agency politics is definitely superior as well, although a very, very large amount of my preference for "Body of Lies" comes from the script by "The Departed" scribe William Monahan. 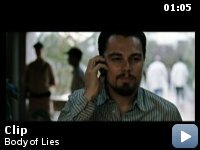 "Body of Lies" bizarrely manages to work as both a hugely entertaining, nifty action thriller and as a socially/politically-conscious drama. I can't believe I'm about to say this, but it really does go from "Syriana" to "The Bourne Identity" in a second, and does so without feeling ridiculous, contrived, or silly. It just somehow pulls it off, and I'm crediting Monahan with most of this success although Scott certainly handles the shifts in tone extremely well. 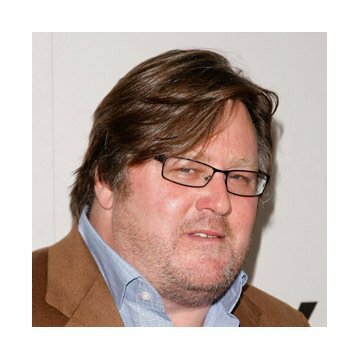 All you should know about the story going in is that DiCaprio plays Roger Ferris, a CIA field agent in an important position in the middle east division, just below the leader of the division Ed Hoffman (played by Russell Crowe), a snarky, racist, and mostly unlikeable man who leads the missions remotely through his laptop and cellphone. Ferris uncovers a lead on a major terrorist leader potentially operating out of Jordan, and chooses to act on it, involving Jordanian intelligence leader Hani Salam, played brilliantly by Mark Strong. His performance is just the right side of slightly hammy, and works wonderfully well. There are twists and turns and it's a lot of fun. Now here's where I'm going to start sounding really bizarre: I know I just said it was a lot of fun, but there's a good amount of substance here and a good deal to be learned about middle-eastern politics (having lived there for many years, I can assure you that this film works as a primer on the mindset and cultural feel of the locations it is set in, and of the political system there. Its observations on Jordanian intelligence in particular are very much spot-on. There are scenes where the film gets really dark and serious, and they completely work as well. In particular, for a white American screenwriter's work, this is incredibly perceptive and understanding of how Jordanians act and feel. Something like "Rendition" from last year, while generally just not a good film, was also hopelessly inaccurate on just about everything. There was no work there, just a message the filmmaker wanted to send. 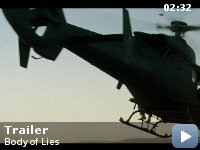 With "Body of Lies", every second feels (and is) authentic and real (outside, perhaps, of some of the details of the espionage aspects, although the writer of the book it was based on was CIA), and there's even some cultural jokes completely in Arabic, untranslated on screen, that basically no non-Arabs will understand. 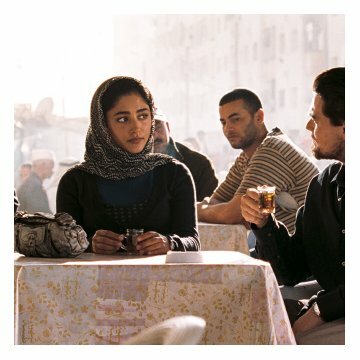 It's a remarkably vivid, real portrait, and considering Hollywood's past of portraying Arabs generally in a 'dem Ayrabs, we America' way, which completely ignored the basic dress and attitude of real Arabs, something like this is refreshing. The movie isn't perfect, and there's a key scene at the end which feels very didactic and heavy-handed (although judging by the twentysomethings who left the theater talking about how cool one of the torture scenes was, even a message delivered this bluntly just isn't getting into their thick skulls), but it somehow gets away with being an enjoyable genre piece and a genuinely thought-provoking and perceptive film (but not one which focuses on these elements to the point of being overbearing), with actual understanding of mid-eastern politics and culture, wonderfully involving characters (including the refreshingly non-sexual love interest Aisha, played by Iranian actress Golshifteh Farahani), and even a surprising sense of humor. "Body of Lies" is most definitely a cut above most in its (overall quite poor) sub-genre, and one of the biggest surprises of the year.